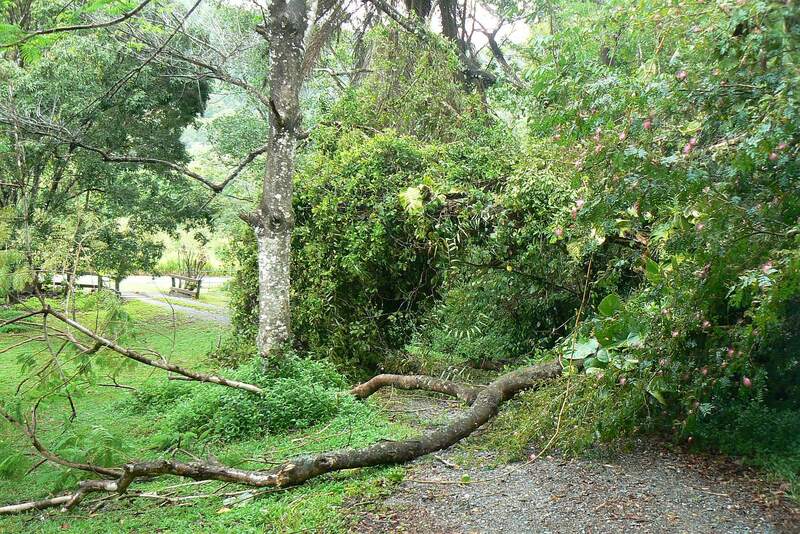 Yesterday evening we heard a loud crrraasshh nearby - quite a common sound in the rainforest as the trunks or branches of older trees sometimes rot away sending them crashing down (self-pruning we call it!) - so we didn't think too much about it until we saw guests who had gone into Daintree Village for dinner walking up the drive in the pitch dark. They said a tree was blocking the way so they'd left their car the other side. Peter took the tractor down but a) it was too dark to see much and b) the trunk he did see was too big for the tractor to move. So early this morning we found it was actually two huge trees which had brought down a lot of other folliage and vines too. Out with the chainsaw ... which instantly got jammed into the trunk. Out with the tractor to try and move it a little so Peter could get the chainsaw free ... to find the tractor and the spare drum were both out of diesel! So a 40km round trip into Mossman for fuel. But a happy ending with a clear driveway again - thank heavens for tractors!